We love this flydrive itinerary through some of the most glorious parts of Canada, through Vancouver Island and along the Sunshine Coast of British Columbia. Exhilarating Zodiac trips, fun watersports and wonderful wildlife spotting opportunities await. It’s a tailormade itinerary, so if you fancy more time at the West Coast Wilderness Resort or less time in the city, then just let us know. Fly into Vancouver and transfer independently to your hotel. We recommend at least two nights in this fantastic city, to give you chance to explore the sights and experience the great food scene. You can explore Vancouver in many ways, but why do a bus tour when you could do a stand up paddle boat tour? You can be guided along the Vancouver shoreline to see all the sights from the water with a commentary on insightful facts and stories about this great coastal city. If you don’t fancy standing up for your tour, then take a kayak tour in the morning when the waters are nice and calm. This morning you’ll pick up your hire car, head south out of the city to the ferry port at Tsawwassen, where you will board a BC Ferry. 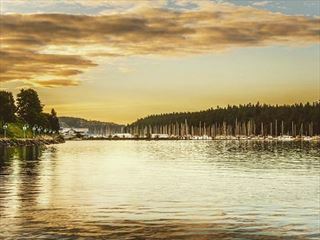 Enjoy the cruise across the Strait of Georgia to Swarz Bay, and then continue south to the BC capital – Victoria. 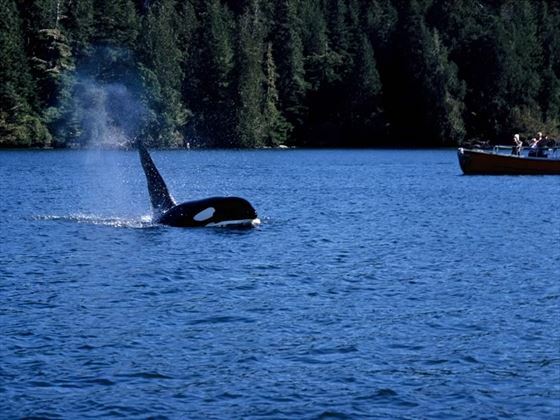 There are some great whale watching and wildlife spotting cruises from Victoria, and you could choose the comfort of a larger boat with facilities and refreshments. But we recommend you get closer to the action with a trip in a Zodiac craft offering high speed but great stability so you can have an exhilarating whale & wildlife spotting experience. You’ll be wearing a full length cruiser suit to protect you from the elements, and there will be a fascinating commentary from the marine biologist and naturist on board. 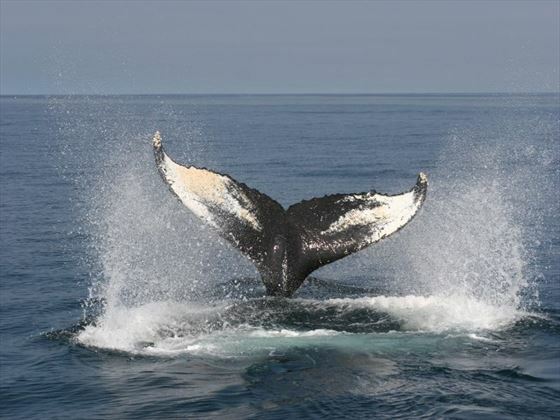 Spot humpback, grey and orca whales, along with sea lions, bald eagles and other sea life. Drive up to the north eastern coast of Vancouver Island, and the well-loved seaside resort of Parksville. 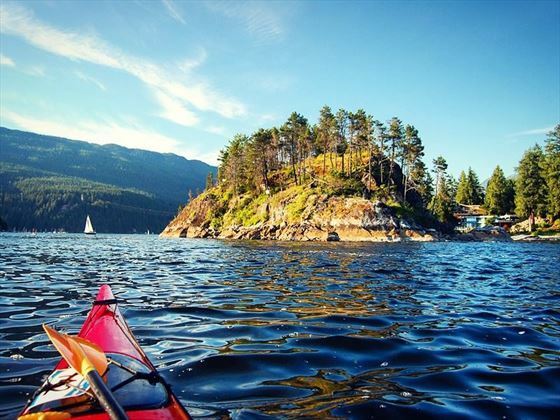 Here you'll find miles of sandy beaches and lovely Provincial Parks, including the ever popular Rathtrevor Beach Provincial Park. You can rent stand-up paddle boards and kayaks locally, which is a great way to explore this delightful stretch of coastline. Today you will be driving through the heart of Vancouver Island, traversing the island, skirting Cameron Lake through the McMillan Provincial Park, along Sproat Lake, past Clayoquot Provincial Park, along the banks of Kennedy Lake and then into the stunning Pacific Rim National Park until you reach Tofino – a spectacular route! 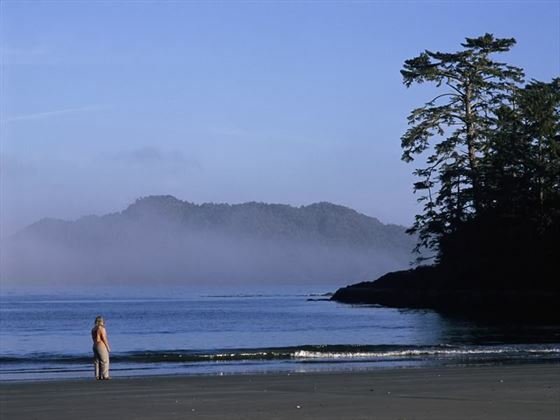 On this itinerary we’ve included three nights in Tofino so that you can really enjoy this spectacular part of British Columbia. 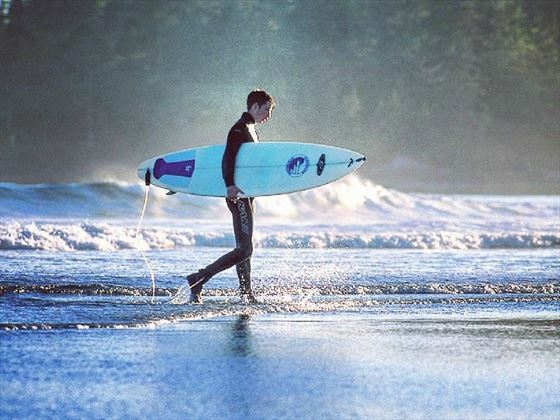 Tofino the surfing capital of Canada and known through the world for it uncrowded beaches and vast shorelines, which means that every surfer has the space to tear up big waves or learn on smaller ones without interfering with each other. 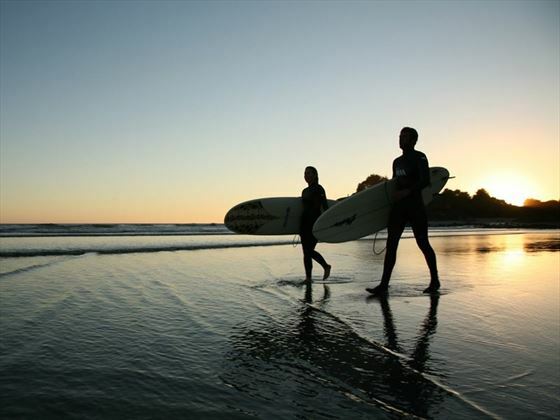 In the winter it is one of the world’s premier cold-water surf sites and in the summer some will surf as late as 11pm with the glowing sunset illuminating the way. You can book your surfing experience locally in one of the excellent surf schools. Tofino is also a great place for a wildlife experience, and we can book you some exciting trips. How about a Coastal Bear Watch in a Zodiac? 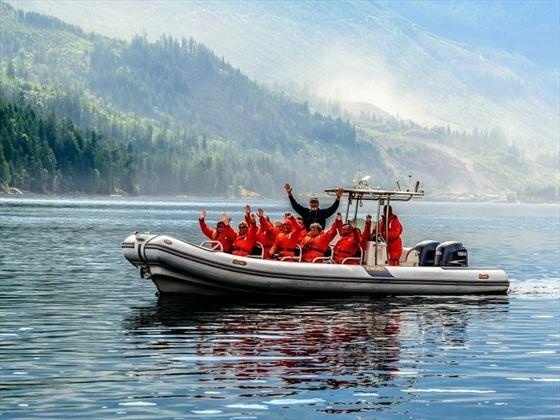 Or a full day Bear & Whale Safari, when you’ll also spot sea lions and sea otters. 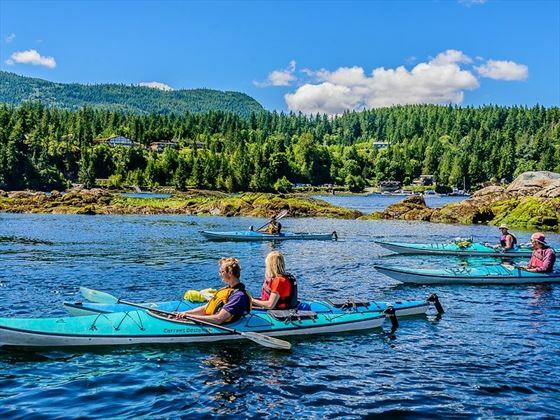 Or if you have an excess of energy then take the Rainforest Kayak & Hike, which takes you through the sparkling waters of Clayoquot Sound to the Big Tree Trail on Meares Island where you will be awe struck by the huge cedar trees that are over a thousand years old. 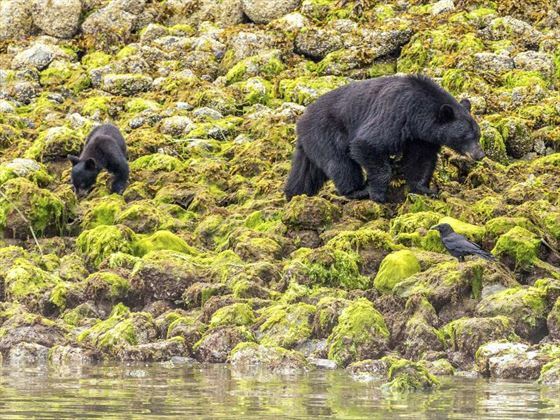 This morning drag yourself away from Tofino and head to Comox where you’ll find some beautiful parks such a Nymph Falls Nature Park where you can swim in natural pools and Seal Bay Nature Park with a walking trail through the forest. There’s lots of water-based fun to be had around Courtnay and Comox. You could rent kayaks, or go on a sport fishing trip to catch (& release) salmon. Another attraction of this area is the wine, and there are some lovely wineries to visit, and the Fisherman’s Wharf at Comox is a great place for a stroll to watch the seals playing in the harbour and lots of nautical activities to watch. You’ll be leaving Vancouver Island today and returning to the British Columbia mainland. It will be a scenic trip firstly on the ferry from Comox to Powell River, then driving along the coast to Salter Bay, taking another ferry to Earls Cove. You’ll then check into the lovely West Coast Wilderness Lodge for a couple of nights. There’s a great choice of tours available from this lodge, including a breathtaking Zodiac tour of the local islands, inlets, rapids and waterfalls, spotting wildlife along the way. You could also visit the impressive Skookumchuck Rapids – the fastest salt water rapids in North America, with boiling tidal currents. There are some gorgeous walking trails around the area, from a gentle stroll to a more challenging hike. Enjoy a picturesque drive on this the final day of your holiday, taking the BC Ferry from Langdale to Horseshoe Bay, then onto Vancouver Airport to drop off your hire car and fly home.